I wanted to look at Paris through Hemingway's eyes. I was not disappointed. I purchased this book for my husband for Christmas and he was thrilled. The book is in very good condition, with the exception of written notes on the pages of the book from its former owner. My husband was not perturbed by this, however, as he thought it rather interesting to view her thinking about the subject at hand. Hemingway wrote this autobiographical tour of Paris some time before he died; it was published posthumously by his widow, Mary. 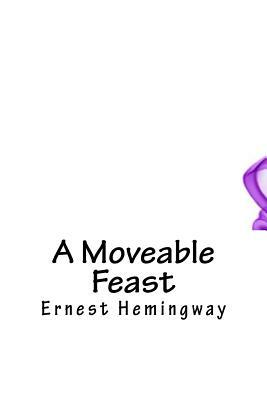 A movable feast is an expression Hemingway used often in his earlier works, such as Across the River and Into the Trees--published in 1950. "Happiness is a movable feast." "Next Saturday is a movable feast," and "If you're lucky enough to have lived in Paris as a young man,then wherever you go for the rest of your life, it stays with you, for Paris is a movable feast." Here Hem takes you on a guided tour of the places in Paris, mostly clean and well lighted, where the food was good and cheap and where he could drink and write the bits of overheard conversation you'll find in his novels and stories. Having been in Paris as a young man, reading this book was quite moving.